Why settle for one great print when you can have two? 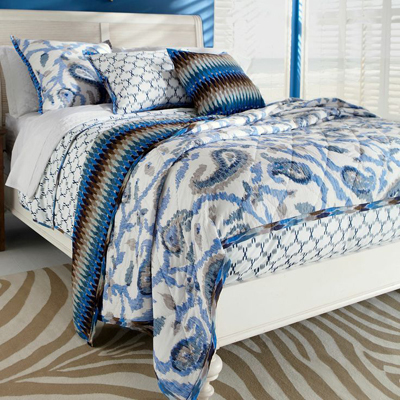 The unique reversible quilt in this Vasanti / Priya Bedding Collection pairs blue, white, and brown paisley and ikat patterns together for an unexpected look. Made from a light 100% cotton voile, its trimmed with a 1″ ikat flange and is machine washable. $49-$299 Sale $39-$239. Buy here. Best operate you might have done, this great site is basically awesome with amazing facts. Time is God’s way of retaining almost everything from occurring directly.